EVERYONE in the Capitol is talking about the 23 State Senators who have gone on record by cosponsoring Stand-Your-Ground law — and about the ones who have not. Of course, gun owners statewide know that it was the Stand-Your-Ground and Constitutional Carry battles of the last few years that cost anti-gunners control of the Senate in the first place. Gun owners, from all over the state, sent a resounding message last Fall: You refused to do your job to defend our Second Amendment freedoms, so we’re going to elect someone else who will. That’s why it’s vital that the new majorities in Des Moines back up their campaign promises with legislative deeds. That starts with backing Stand-Your-Ground law, filed by Senator Rick Bertrand. Currently Senators’ Anderson, Behn, Breitbach, Brown, Chapman, Chelgren, Costello, Edler, Feenstra, Guth, Johnson (Craig), Johnson (David), Kapucian, Kraayenbrink, Lofgren, Rozenboom, Schultz, Segebart, Sinclair, Smith, Zaun, and Zumbach have signed on. This is a fantastic showing for this bill, and it’s due to your relentless calls and emails to your legislators. There have been some surprises, though, in who has refused to cosponsor as of this morning. One such surprise is newly elected Senator Dan Dawson, from Council Bluffs. As IGO members will remember, it was Senator Dawson’s signed pledge to back this legislation that made him stand so far apart from former Senator Gronstal. That kicked off a massive program — paid for by the donations of IGO members — to expose Gronstal in Council Bluffs and Carter Lake using everything from a door-to-door program to TV and radio ads that blanketed Western Iowa. Armed with these facts, gun owners stormed the polls last fall and retired Gronstal’s 34-yr. career. But for some reason, Dawson still refuses to back the bill he said he would support while on the campaign trail. 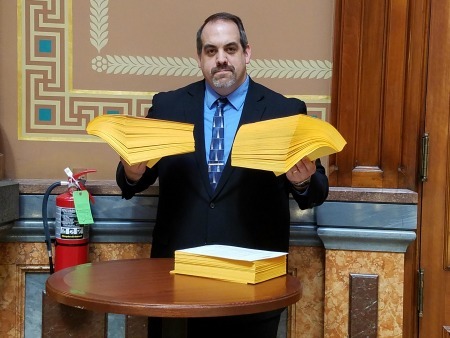 That’s why, moments ago, Iowa Gun Owners staff delivered almost 800 signed petitions from Council Bluffs and Carter Lake to Senator Dawson — to remind him how many gun owners want to see him support this legislation! Yeah, this may not make us the most popular group in the Capitol, but this organization was never founded to play games in Des Moines like everyone else. We fight for one group of people: our members and supporters. So when a politician tells gun owners at election time that he’ll support Stand-Your-Ground law and then refuses to do so once elected — he’d better believe that that’s going to get back to gun owners in his district! This is where the rubber meets the road in Iowa. Are we going to sit back and allow the legislature to ignore gun owners now that Gronstal, Sodders, and the rest have been kicked to the curb? Or are we going to insist that these pro-gun majorities do what they said they would do — pass major pro-gun reforms? Please help us make sure that the following Senators hear from you TODAY, about signing onto Stand-Your-Ground law as a cosponsor! This bill will be filed TODAY. The Senators listed above only have a few more hours to get on board with this bill — so please call, email, and message them on Facebook right away! Talk is cheap. What you want is direct action. Insist that they cosponsor the bill today! We’re delivering petitions today to Senator Dawson, Schneider, Whitver, and more, doing all we can to remind them that there are hundreds of gun owners in their districts who want to see them back these bills. Please stand with us by doing what you can to contact these Senators right away! We’re down to the wire. Once you’re done, I really hope that you’ll consider chipping in something to help us run our mobilization program for Stand-Your-Ground law. Any amount that you can give goes immediately into helping us mobilize Iowans through direct mail, emails, and social media. Whether you can give $250 or $500 as some have done, or whether $100, $50, $25 or $10 is more appropriate, please do what you can right away. Whatever you do, please contact the names listed above immediately — that’s most important. P.S. Moments ago, IGO staff and volunteers dropped THOUSANDS of signed petitions on the desks of Senators who’ve still not cosponsored Stand-Your-Ground law! This bill will be filed today, meaning that this is their last chance to stand up for the Second Amendment by cosponsoring this bill. Now’s not the time for politicians to play games in Des Moines, it’s time to advance major pro-gun reforms while they have the chance. Please contact the names listed above –- right now -– and insist that they cosponsor Senator Bertrand’s Stand-Your-Ground bill today. Once you’re done, please consider a donation of any amount to help us involve as many gun owners as possible using mail, email, and social media! More Support for Stand-Your-Ground Legislation! Gun Control Introduced in the Iowa Legislature!